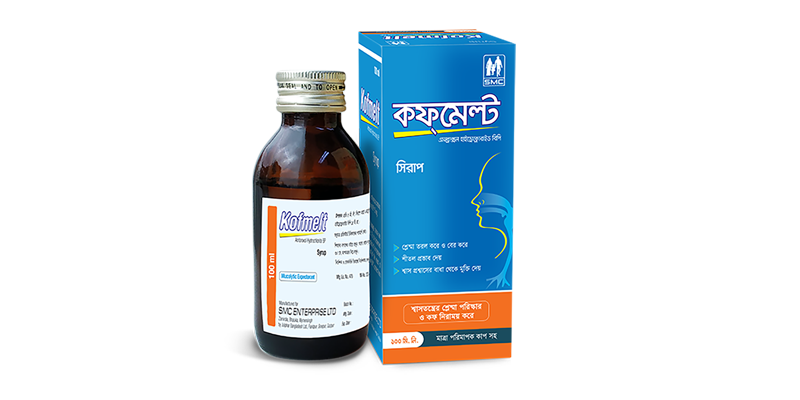 Kofmelt syrup: Each 5 ml syrup contains Ambroxol Hydrochloride BP 15 mg.
Ambroxol Hydrochloride is the active metabolite of Bromhexine and it has been proven that this metabolite possesses a greater bronchosecretolytic effect than Bromhexine. It improves sputum rheulogy by hydrating mechanism leading to liquefication of mucus in the lumen of respiratory tract, thus facilitating expectoration of mucus and reducing dyspnea. It stimulates production of phospholipids of surfactant by alveolar cells, thus contributing to the lowering of superficial tension in the alveoli. It also reduces bronchial hyperactivity. Ambroxol has anti-inflammatory properties owing to the inhibitory effect on the production of cellular cytokines and arachidonic acid metabolites. In patient with COPD it traditionally improves airway patency. 2-5 years old - 2.5 ml (1/2 teaspoonful), 2-3 times a day, 5-10 years old - 5 ml (1 teaspoonful), 2-3 times a day, 10 years old and adults - 10 ml (2 teaspoonful), 3 times a day. Gastrointestinal side effects like epigastric pain, stomach overfill feeling may occur occasionally. Rarely allergic responses such as eruption, urticaria or angioneurotic edema has been reported. Contraindicated in known hypersensitivity to Ambroxol or Bromhexine. Ambroxol should be given cautiously to patients with gastric and duodenal ulceration or convulsive disorders. Patients with hepatic and renal insufficiency should take it with caution. Ambroxol should not be taken simultaneously with antitussives (e.g. Codeine) because phlegm, which has been liquefied by Ambroxol might not be expectorated. Teratogenic and foetal toxicity studies have shown no harmful effect of Ambroxol Hydrochloride. However it is advised not to use it in pregnancy, especially during the 1st trimester. Safety during lactation has not been established yet. Kofmelt syrup: Bottle containing 100 ml syrup with measuring cup.